His Highness Sheikh Mohamed bin Zayed Al Nahyan, Crown Prince of Abu Dhabi and Deputy Supreme Commander of the UAE Armed Forces, yesterday toured The Founder's Memorial', a permanent national tribute dedicated to commemorating the life, legacy and values of the UAE's Founding Father, the late Sheikh Zayed bin Sultan Al Nahyan. Upon his arrival, Sheikh Mohamed was received by Yousef Al Obaidli, Director-General of the Memorial, and the employees, where he listened to an explanation about the services and programmes offered to visitors from the UAE and around the world about the biography of Sheikh Zayed as a human being and a leader, enabling people to gain a deeper understanding of his life, legacy and values. Sheikh Mohamed expressed his appreciation of the working team in introducing Sheikh Zayed's inspirational and generous philanthropy, making him a global model. "I am proud of your role and efforts in conveying the legacy of Sheikh Zayed and introducing his ideas, vision, humanitarian principles, issues of concern to him, foremost of which is the mankind, which is the pillar of progress and development," he said. During his tour, he was briefed by Amina Jassem Al Hammadi on the memorial's sections that shed light on the legacy of Sheikh Zayed and his noble human values. 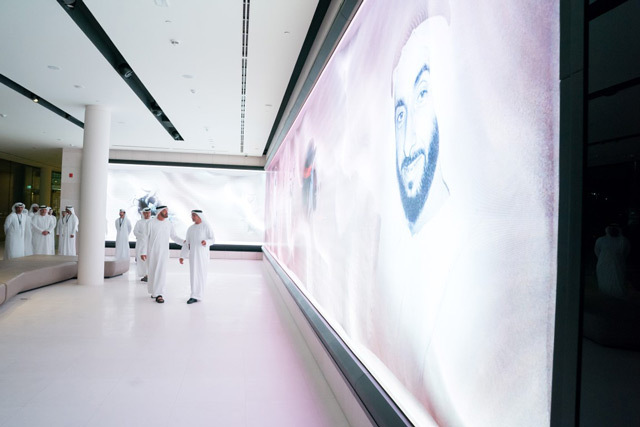 He visited the 'Welcome Centre', where visitors can learn about Sheikh Zayed through art, nature, words, stories, and multimedia experiences, and offers a range of personal encounters with the late Sheikh Zayed to understand the vast influence he had on both the UAE and the world. Sheikh Mohamed also visited the Heritage Garden, which has 188 trees including five local types. He also saw the 'Constellation', a monumental public artwork featuring a dynamic three-dimensional portrait of Sheikh Zayed.